Southport have signed Accrington Stanley and Northern Ireland Under-21 international striker James Gray on a loan deal until the end of the season. 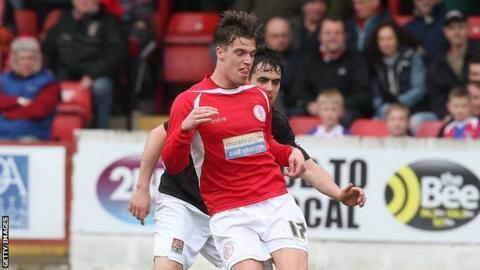 The 22-year-old has made 76 appearances and scored 14 goals since joining League Two side Accrington in 2012. Southport sit 20th in the Conference, with just 31 goals this term. "James Gray will add to our squad as we look to improve our goalscoring return," manager Paul Carden told the club website. Gray is the second striker to join the club in February, after the signing of Hyde forward Louis Almond on transfer deadline day. Meanwhile, three players have left the Sandgrounders on loan. Winger Micah Evans and left-back Johnny Lynch have signed for Conference North side Worcester City, while forward John Marsden has joined Conference rivals Lincoln City until the end of the season.